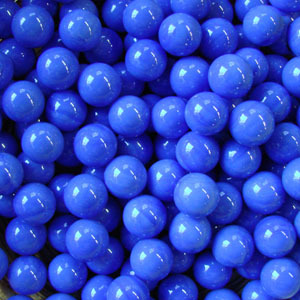 MoonMarble.com - Opaque Blue 9/16"
Bulk Marbles → Decor Marbles - approx. 14mm or 9/16" → Solid Colored Game Marbles - 9/16" → Opaque Blue 9/16"
These solid blue marbles are a common colored marble used in games such as Chinese Checkers or Wahoo. These marbles are sold in bulk quantities, individually or assorted with other colors. There are approximately 100- 120 marbles in a pound. They are also available in approximately 250 count, 500 count, and 3000 count bulk quantities. Note: These counts are approximate and not guaranteed amounts. Sizes and color may vary slightly. Warning! : Choking Hazard. This toy is a marble. Not recommended for children under 5 years.